Sol, the region’s leading supplier of energy products, continues to reward customers for their continuous support, by giving them the opportunity to win free fuel for life. Customers in Grenada will soon experience this rewarding opportunity, when the Free Fuel For Life promotion is launched later this month. This highly anticipated promotion will begin at select Sol service stations on January 21, 2016. 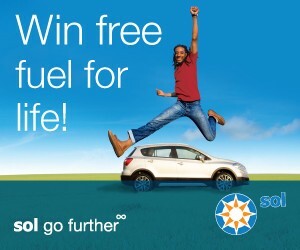 One lucky customer will claim the ultimate prize of Free Fuel For Life from Sol, valued at EC$6,000 per year. With every EC$50 spent in fuel at participating service stations across the island, customers will receive an entry form to participate in the competition.The promotion will run for a period of 10 weeks and will conclude on March 31, 2016. The grand prizewinner will be selected on April 4, 2016. Customers participating in the ‘Free Fuel For Life!’ promotion will also have additional opportunities to win prizes and enjoy a number of courtesy services with two weekly activities: ‘Tune-up Thursdays’ and ‘Fantastic Fridays’. On select Thursdays throughout the promotion period, a special team will be on site at pre-determined stations to offer complimentary oil, tire and fuel checks. This team will also be distributing Sol-branded tokens to customers. The ‘Fantastic Fridays’ promotion will occur on select Fridays during the promotion period, when a special team will conduct weekly draws at pre-determined stations. The prize for these weekly draws will be fuel prizes valued at EC$250. Mr. Bain said that the launch of ‘Free Fuel For Life!’ and the weekly promotions to customers in the Grenadian market is an example of Sol’s commitment to its customers with quality products and exceptional service. The promotion has had an extremely successful run in Barbados, St. Lucia and St. Maarten.